St. Louis County is located in the far eastern portion of the U.S. state of Missouri. It is bounded by the city of St. Louis and the Mississippi River to the east, the Missouri River to the north, and the Meramec River to the south. As of the 2016 Census Bureau population estimate, the population was 998,581, making it the most populous county in Missouri. Its county seat is Clayton. 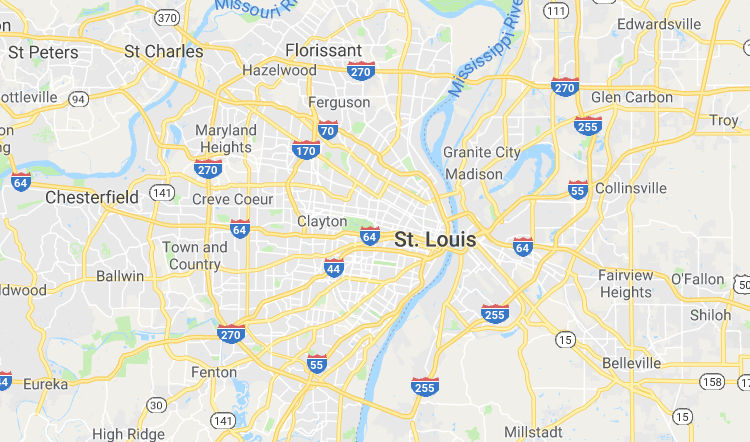 St. Louis County borders, but does not include, the city of St. Louis, which is an independent city. The county is included in the St. Louis, MO-IL Metropolitan Statistical Area. According to the U.S. Census Bureau, the county has a total area of 523 square miles (1,350 km²), of which 508 square miles (1,320 km²) is land and 15 square miles (39 km²) (2.9%) is water. As of the census of 2010, there were 998,954 people. There were 404,765 households with 263,423 family households. The population density was 1,966 people per square mile (773/km²). There were 423,749 housing units at an average density of 834 per square mile (322/km²). The racial makeup of the county was 70.3% White (68.9% Non-Hispanic White), 23.3% African American, 0.2% Native American, 3.5% Asian, 0.03% Pacific Islander, 0.9% from other races, and 1.9% from two or more races. Hispanic or Latino of any race were 2.5% of the population. There were 404,765 households out of which 31.0% had children under the age of 18 living with them, 51.00% were married couples living together, 12.70% had a female householder with no husband present, and 33.00% were non-families. 28.00% of all households were made up of individuals and 10.10% had someone living alone who was 65 years of age or older. The average household size was 2.47 and the average family size was 3.05. Bio-One services all types of trauma, distressed property, and biohazard scenes in communities throughout the St. Louis Area. We partner with local authorities, communities, emergency services personnel, victim services groups, hoarding task forces, apartment complexes, insurance companies and others to provide the most efficient and superior service possible.